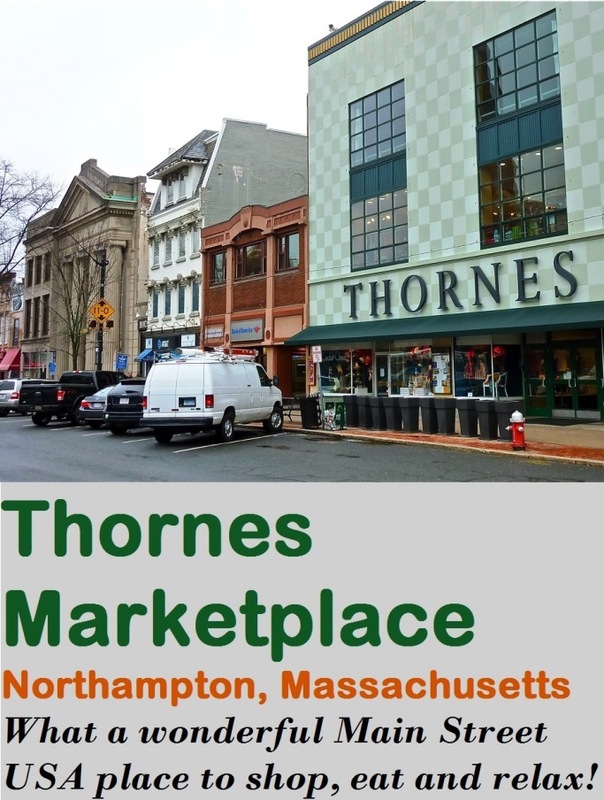 Thornes Marketplace on beautiful Main Street in Northampton. Apparently, small town Main Street USA never really died. 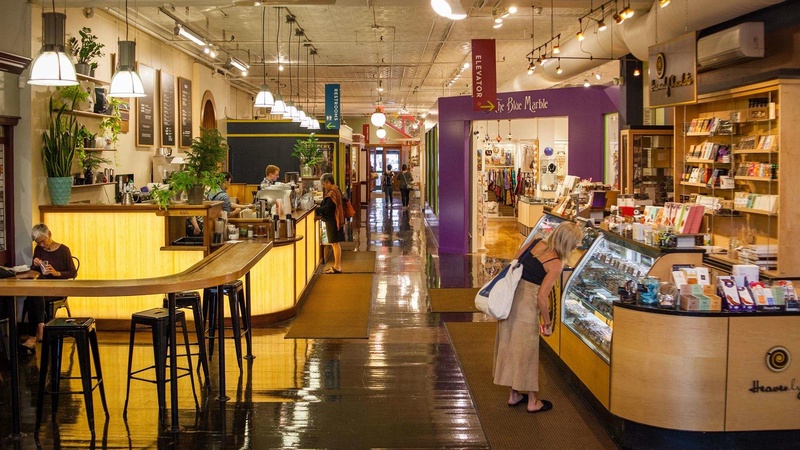 It just went straight to a slice of heaven called downtown Northampton, Mass., with Thornes Marketplace serving as the cornerstone business. Walking Main Street toward Thornes -- a wonderful collection of nearly 30 merchants -- the 19th streetscape architecture warms the nostalgic soul while satisfying 21st century needs in the form of boutiques, galleries, restaurants and coffee houses. Arriving at Thornes seems like the entrance to a retail version of Camelot with its grand tall green-tiled facade and awning and rising two-story windows. It's a larger-than-life sight, like a restored white castle (in this case, green) amongst surrounding castles in the form of charming Victorian commercial and classical revival architectural styles. The whole scene almost makes fabled Bedford Falls, with its memorable small-town Main Street virtues, in the classic movie "It's a Wonderful Life," seem drab in comparison. Only, this is real life with coming attractions virtually every step of the way. 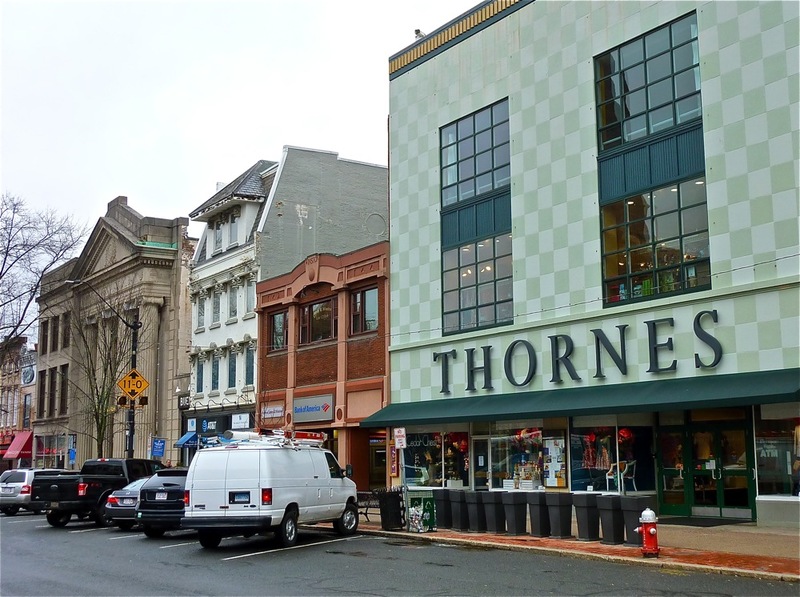 Once inside and exploring the environs at Thornes, it is apparent that the classic Main Street USA presence of downtown Northampton permeated every interior corridor, stairway and storefront here. What's more, if you took all the small businesses out of Thornes and spread them across a downtown, you would have one of the greatest Main Streets on the planet. Nice, though, that they are all located in one authentic, genuine community gathering place where everything seems so real and not scripted and contrived the way it can be on the lost highways of strip malls and shopping centers in "Anytown USA." Thornes Marketplace has been wonderfully restored. Photo source: Thornes Marketplace Facebook page. Thornes appears to have everything one needs in a small town (or city, in this case), and then some. 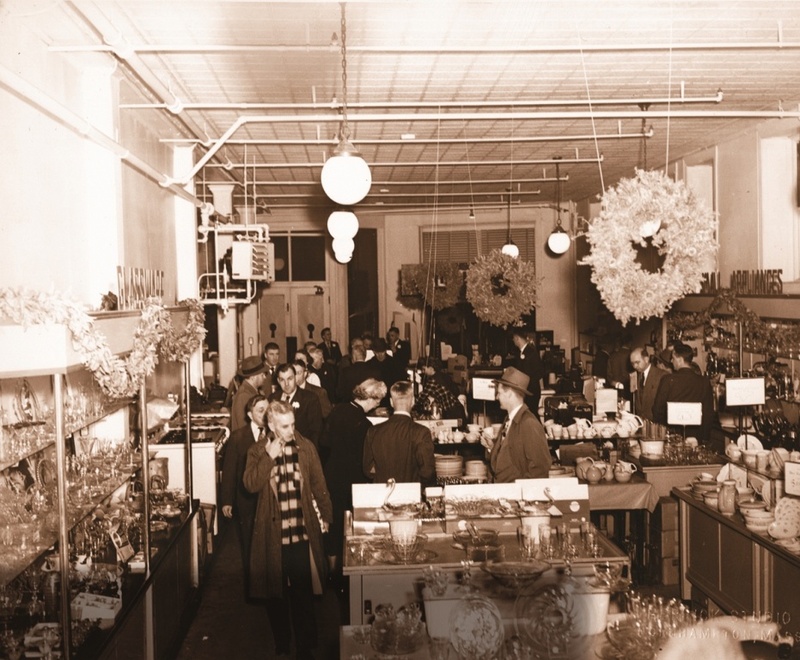 Businesses include women and men's clothing stores, a bookshop, ice cream parlor, chocolate store, old-fashioned candy shop, health food store with local organic produce, places to eat and drink including a wine cellar, a Woolworth's-like discount shop (Acme Surplus), and storefronts for gifts, home decor, stationery, antiques, jewelry and accessories. Interesting shops saturate Thornes Marketplace. For modern preferences, Thornes also houses yoga, spa, physical therapy, massage and neurofeedback services. 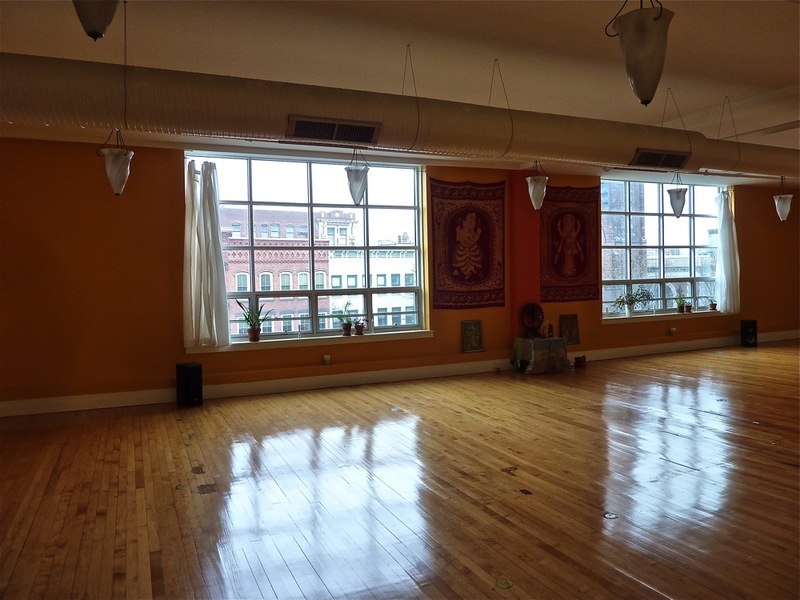 The Yoga Sanctuary at Thornes Marketplace. Regulars and visitors soon realize, however, that it's not just the shops, food and services that make Thornes a destination, but the history, the nooks and crannies, the unique vibe and the-one-of-kind look that creates an enormous appeal. The template of the original store, though, never went away with history virtually every step of the way. The grand look of Thornes Marketplace. Each of the four stories has a story to tell. A walk through reveals nostalgic flourishes like old wooden staircases, pressed tin ceilings, large palladium windows, sometimes creaky and uneven floors and exposed ductwork. The continuous, effective restoration projects, however, would make the most finicky HGTV restoration host proud, however. 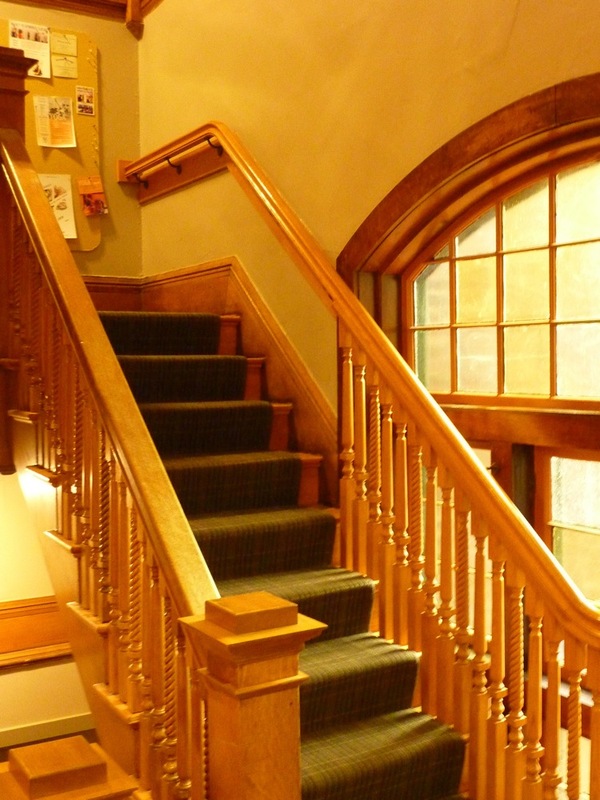 Restored staircase at Thornes Marketplace. There's even a working Dip and Dunk photo booth, one of only 10 remaining in Massachusetts! The cost for taking a photo is more than back in the day at $4, but the experience priceless. 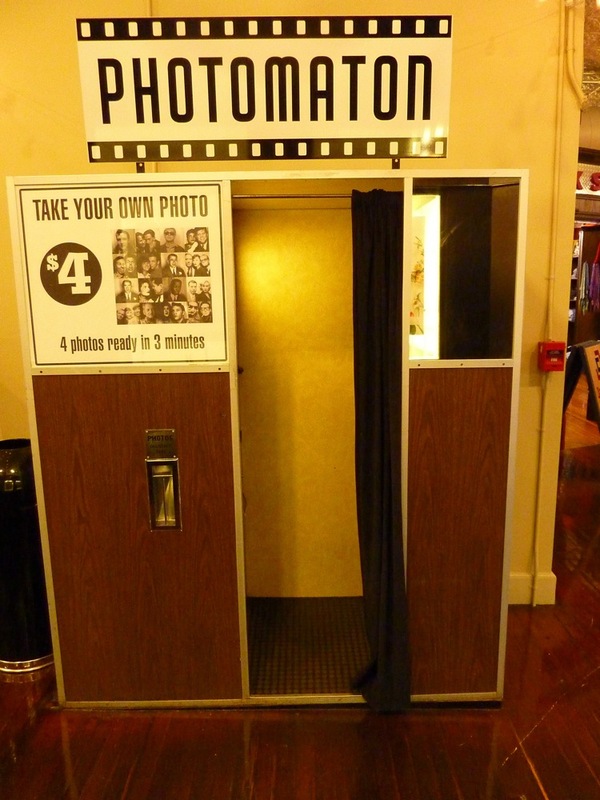 One of the last functioning Dip and Dunk Photo Booths in Massachusetts Can be found at Thornes. 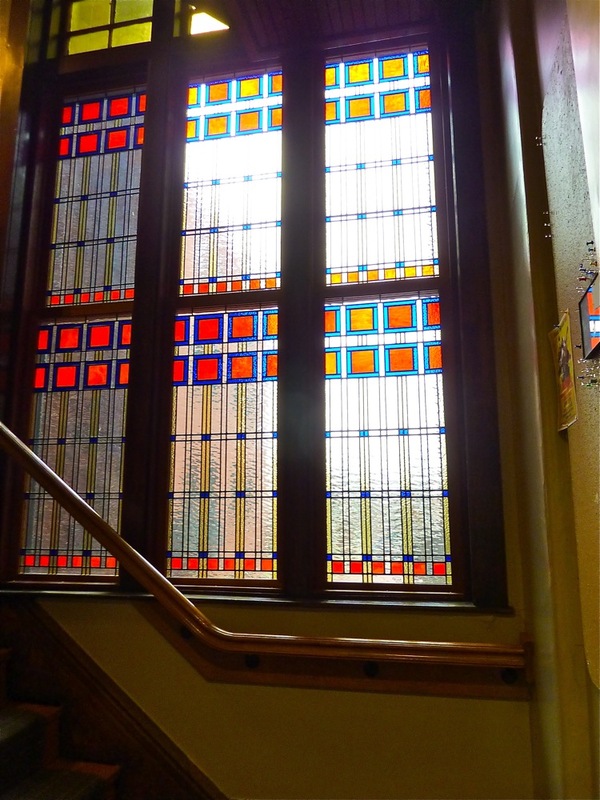 Modern initiatives -- made to look old -- add to the historic look, as evidenced by stained glass windows recently created by Easthampton artist Heather McLean. A "new old look" with recently created stained glass. A thorough academic analysis of Thornes would not suffice as part of the appeal cannot be explained, only experienced. It's as if someone collected magic pixie dust from the past and sprinkled tiny particles in and outside the Thornes building to make people feel a special sense of place and euphoria. The 55,000 sq. ft. size has nothing to do with the oversized, sterile chain stores of today. Instead, the building exhibits old world charm and an authentic sense of place that could be compared to a large town with several charming neighborhoods and lots of friendly folks within the community. It's like the progressive version of Mayberry RFD. A festive Main Street holiday scene at Thornes Marketplace. Photo credit: Richard Cowles. Photo supplied by Thornes Marketplace Marketing Department. Thornes Marketplace first opened in 1979, but there's plenty of history behind the grand facade. 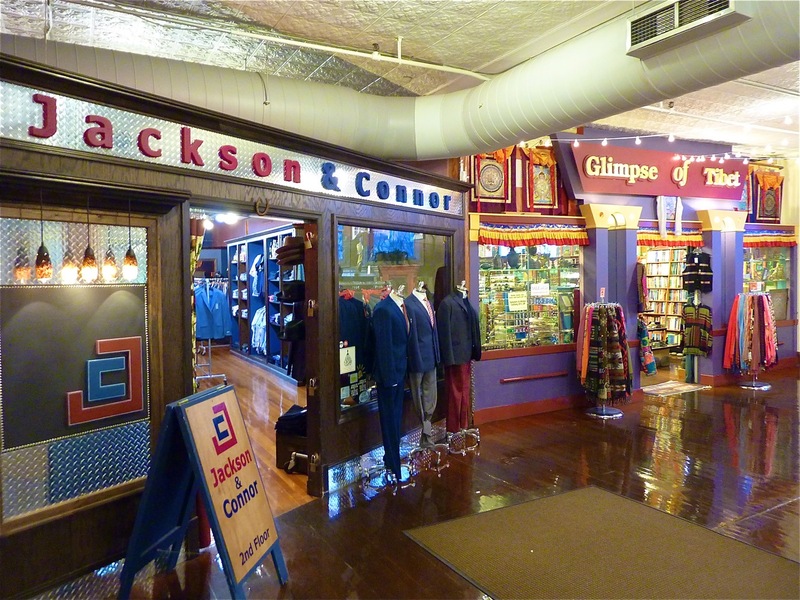 McCallum's Dry Goods claimed the first business here in 1873 and expanded twice through the Calvin Coolidge years until the silk industry faded away and nylon came into fashion following the Great Depression. 150 Main Street then became McCallum's, a five-story department store selling everything a customer could ever need. 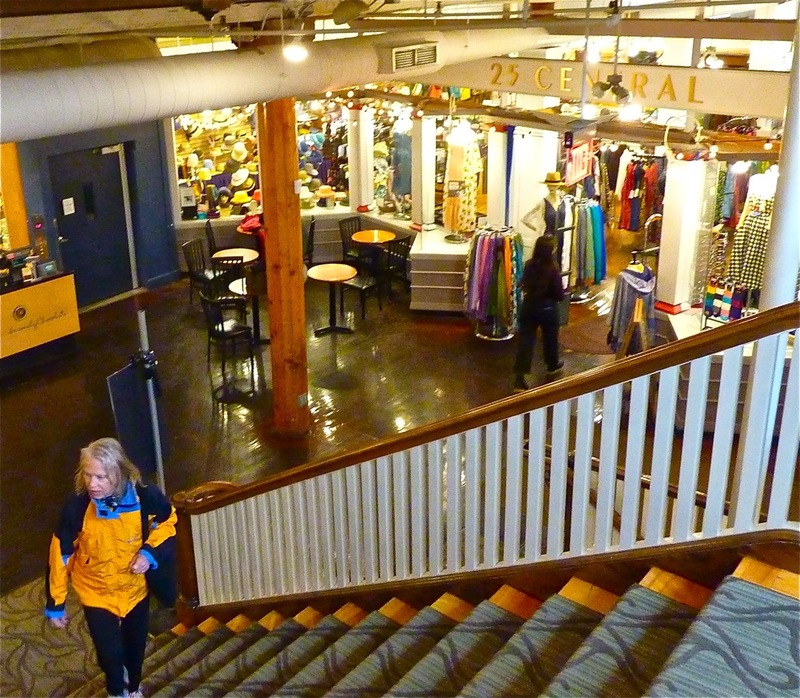 From clothing to furniture to housewares to toys, this was the place to go in town. Back in the day at McCallum's Department Store. Photo supplied by Thornes Marketplace Marketing Department. The gradual demise of downtown department stores increased in the 1970s, however, as huge shopping malls and aggressively marketed chain stores took front and center retail stage in the United States. McCallum's became one of those victims. In 1975, Floyd Andrus bought the vacant and unoccupied building from Revell McCallum in 1975 and soon started a thorough renovation of the property. This would pave the way for a new paradigm in downtown shopping for locals: Thornes Marketplace. 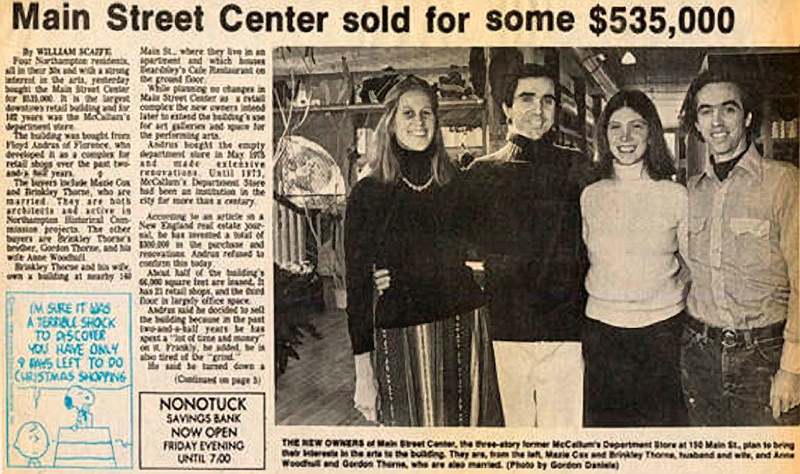 Brinkley and Gordon Thorne, with wives Mazie Cox and Annie Woodhull, purchased the building for $535K from Andrus and opened Thornes Marketplace in 1977. The beginnings of Thornes Marketplace. Photo supplied by Thornes Marketplace Marketing Department. 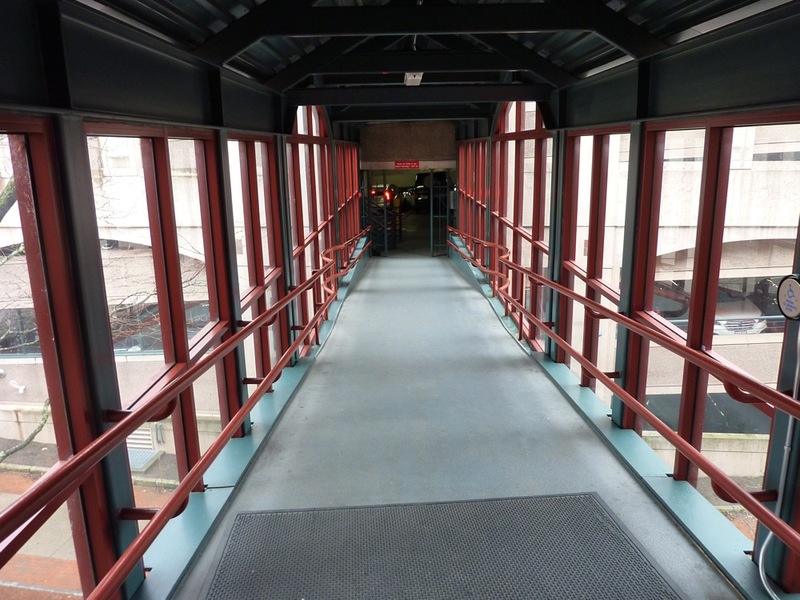 In 1989, a parking garage was constructed behind Thornes and connected with a skywalk. This allowed for more customers to shop at Thornes. Skywalk between parking garage and Thornes. Local real estate investors bought Thornes in 2006, working hard to bring this building landmark into the 21st century with improvements like new windows, floors and bathrooms and a better mix of shops. The renovations and the growing small business vibrancy with more storefronts becoming occupied also served as a microcosm to Northampton's overall comeback as a downtown. For many years, Northampton had that a "year away from being a year away" look -- that is, the central district appeared to be close to fulfilling its tremendous upside but was ultimately marred by too many closed storefronts and some buildings in disrepair. Today, downtown Northampton is not only functional and interesting, but a real joy to look at through the eyes. It combines that idyllic small town downtown look with the amenities of a larger city with Thornes, a farmers market (right outside Thornes), two historic theaters, Smith College (one of the top-ranked women's colleges in the The United States) and the school's Museum of Art contributing greatly to the aesthetics, rich culture and overall thriving nature. The presence of mountains, forests and farmland surrounding the community just adds to the overall appeal. Jody Doele, marketing manager at Thornes Marketplace, can feel the love at Thornes and Northampton. She and husband Dave were living a high stress, big city life in and around New York City, N.Y. They also suffered through the horrors of 9/11 in 2001. "My husband and I were thinking of someplace smaller to live where we could raise our kids in a safer, less hectic environment," said Doele. "We came here in 2010 and never looked back. The people here are tremendous. We have built meaningful friendships and seen so much kindness and sense of community here. Many people who live here could have lived anywhere, but chose Northampton. People have a tremendous sense of place here." "I love my job. The owner is committed to the story of Thornes," added Doele. "The tenants have talked to us about how much they love being in the building. It's really an ideal place to work." 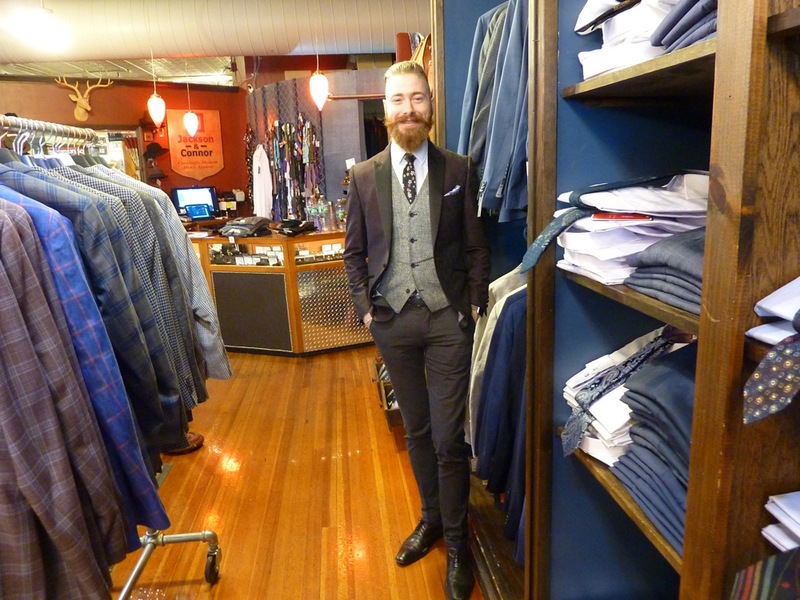 Will Brideau, owner of Jackson & Connor men's clothing store. The merchants of Thornes Marketplace are generally not your cookie cutter owners and that goes for their employees, also. Many personalities fit into the unique, one-of-a-kind nature of Thornes. With personal stories to tell, sometimes strong opinions that aren't held back and an innate sense of expert customer service, it's like the complete opposite of a typical mall experience. Will Brideau, owner of Jackson & Connor men's clothing store (Level 2), might just be the perfect example of an owner who has marched to the beat of his own drum while passionately owning a business that, at first, rejected him. Brideau, who has the mustache and beard of a turn-of-the-century merchant, the attention to detail and service of a retro business owner and the hipness of a 21st-century millennial, never thought he'd end up owning a men's clothing store. He attended nearby Hampshire College in Amherst, Mass. from 2004 to 2008 and soon found himself selling high end "baby stuff" at the former Impish in Northampton. He approached the business owners at Jackson and Connor and "begged for a job," initially to no avail. Repeated perseverance paid off, however, as owners Tara Tetreault and Candice Connors eventually hired Brideau as "pretty much the only employee." Little did Brideau know, at that time, that the owners would choose to close the store. "They just didn't want to go on with owning the store," said Brideau. I wanted to take over the store. I had found something I really loved doing. And they had faith in me. I told them, though, 'I don't know how to run it. I don't have the money to own it.' They found a way to make it work for me, though. I took the plunge in November 2013. It is the only job I have ever loved. Plus, I get to work in a job at a store I own." Will picks and chooses merchandise to be sold in the store by hand. He offers the ideal mix of inventory from types of denim and hoodies to jackets and ties. "Yes, this type of store is a dying breed, but the indie-owned mom and pop shops on Main Street allow quirky places like mine to do well," said Brideau. "It fits perfectly into Northampton." Gabriel Moushabeck brought his bookstore in Brooklyn, NY. to Thornes location in 1997. The handsome two-story Booklinks Booksellers (Level 1 and 2) features new books, greeting cards, gifts, bargains books, and a second story cafe and tea bar. 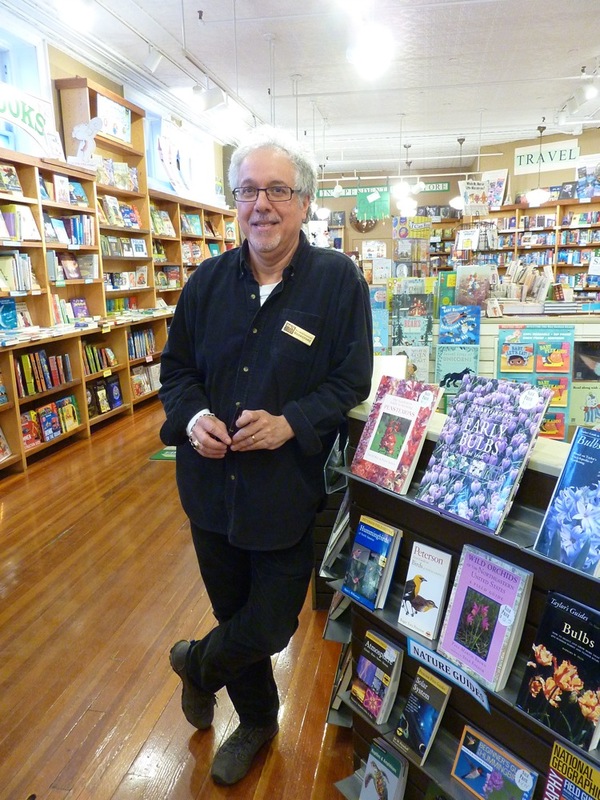 Gabriel Moushabeck, owner of Booklinks Booksellers. "I had book stores in New York City and used to vacation around here at that time," said Gabriel. "When coming here, Brinkley wanted a bookstore at Thornes. I liked the idea of opening a business in Northampton and have no regrets. Many authors and artists come here. They love to support the business. And we are doing well here. It took a while to understand what the customers wanted. You find what they are looking for. That makes a big difference, the personalization amd meeting customer needs. Yes, we have competition from the big booksellers, but we have survived well within a very supportive community and being here at Thornes." Katie Rennie, owner of 25 Central (Level 1), started working at the women's clothing and accessories store along with a best friend several years ago after graduating U/Mass Amherst. There, they started managing and buying together. The owners, Paul and Cherie, were looking to retire, however, and felt that Katie would be a good fit to take over the business. She has done them proud by carrying on the retail tradition while being savvy enough to know what it takes to survive in a brick and mortar business faced with the challenge of an online retail giants world. "Being a brick and mortar store here in Northampton, we really connect with our customers and it's really important I build these relationships where I go to these shows in New York City or Marlborough, Mass., to buy the merchandise for bringing in," said Katie in a Feb. 24, 2018 interview on WHMP radio in Northampton. "I can think about individual customers and what they like and what I see trends in Northampton being." 25 Central is truly a family-run business with Katie's mom, Deb, and her sister, Molly, working there. 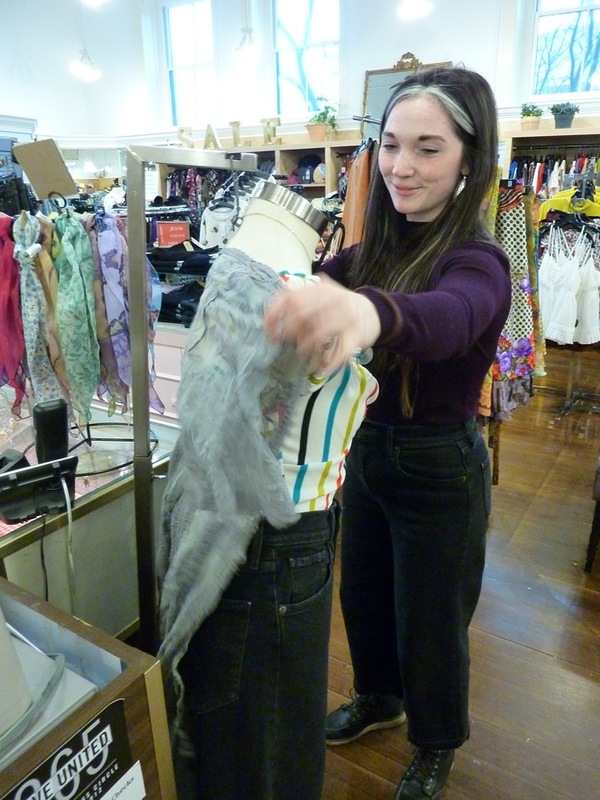 Molly, a manager and buyer, loves working at the ultra cool modern women's clothing and accessories store. Molly Rennie sets up merchandise at 25 Central. "We have a selection you wouldn't find anywhere else," said Molly. "We have something for everyone. Daughters, mothers and grandmothers shop here." Customers can expect to find a fabulous mix of scarves, dresses, hair accessories and jewelry as part of the glorious retail landscape at 25 Central. 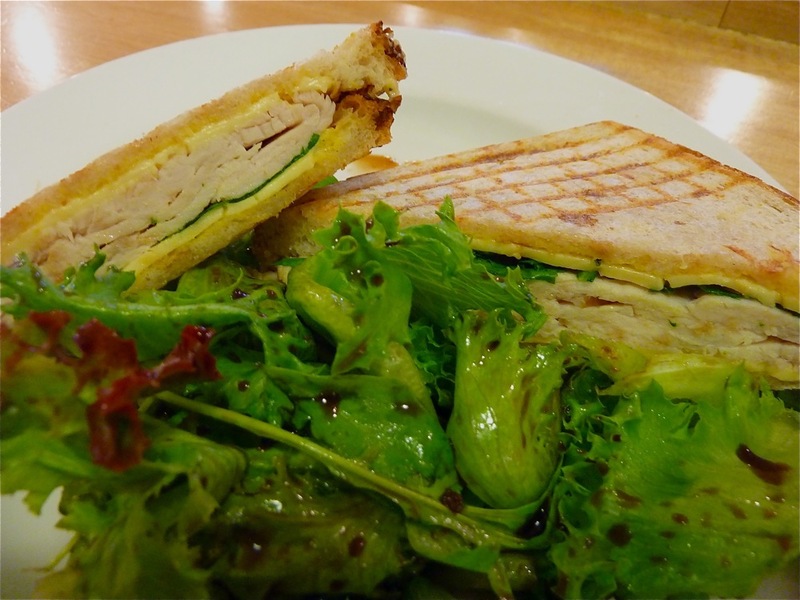 Turkey and smoked Gouda sandwich with fresh greens from Share at Thornes Marketplace. When first walking into the building, Thornes Marketplace seems to be short on places to eat. Walk around a little, build that appetite and know that places to eat and drink can be found not only front and center but also tucked away in the Victorian building. Paul and Elizabeth's (Level 1) is a spacious, comfortable restaurant featuring natural foods for lunch and dinner. Some of their specialties include fresh seafood, tempura and vegetarian soups, salads and main entrees. After owning the restaurant since 1978, owners Paul and Elizabeth recently turned the reins over to son Nate. Healthy food, nice dining atmosphere at Paul and Elizabeth's at Thornes Marketplace. Photo supplied by Thornes Marketplace Marketing Department. "Things will continue on with Nate," said Paul, with a confident but gentle smile. "Family and a love for food has kept us here for 40 years." Share Coffee and Cafe (Level 1) features single origin coffee and espresso, baked goods, soups, salads and sandwiches. It's ideally located at the first main intersection on the first level near the staircase and skywalk to the parking garage. Northampton Olive Oil Company (Level 1) sells high quality infused olive oils and balsamic vinegars, as well as hot sauces, salsas, barbecue rubs and Bloody Mary mixes. 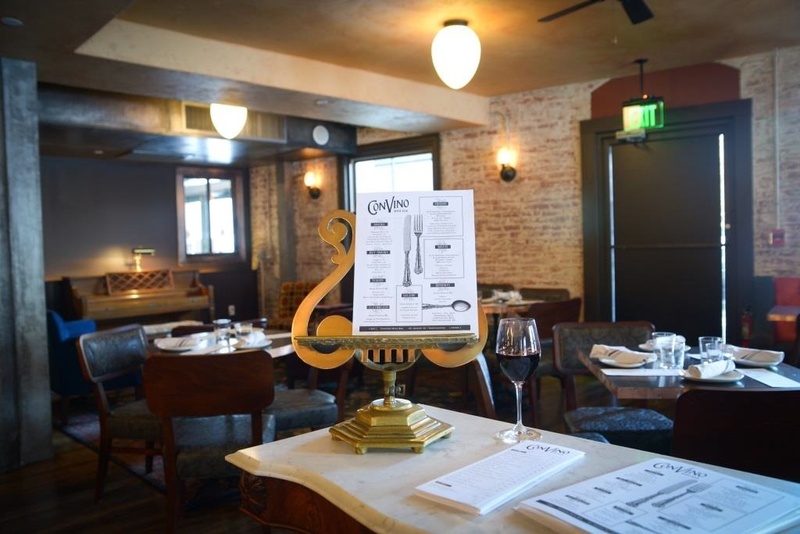 Convino Wine Bar (Lower level 2) offers 70 wines by the glass from all over the world in a cozy lower level setting. 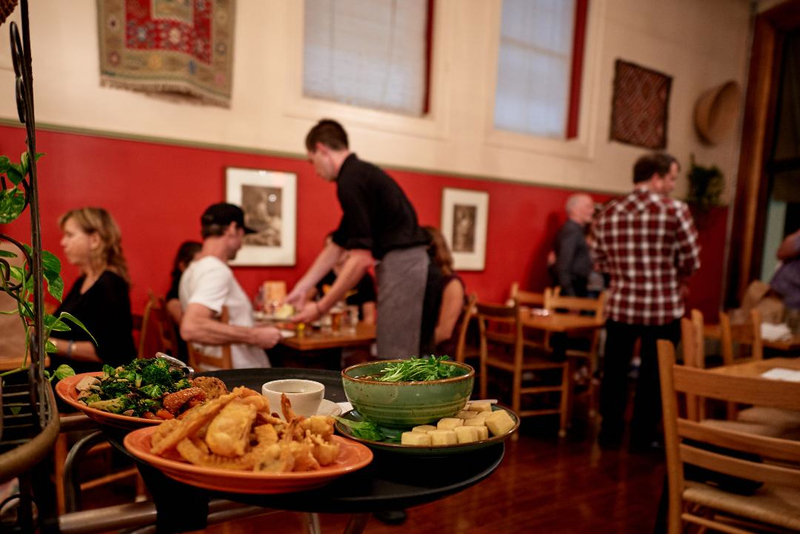 They also serve "small and hearty plates" including cheeses and meats, Greek Mussels, spinakopita, marinated olives, fancy fries with truffle oil and Parmesan, a lamb burger, filet mignon and chocolate and mousse cakes for dessert. Convino Wine Bar. Photo supplied by Thornes Marketplace Marketing Department. One of the first places noticed at Thornes is Heavenly Chocolate (Level 1) with its incredible variety of handmade chocolates made in small batches, as well as from organic and local ingredients whenever possible. 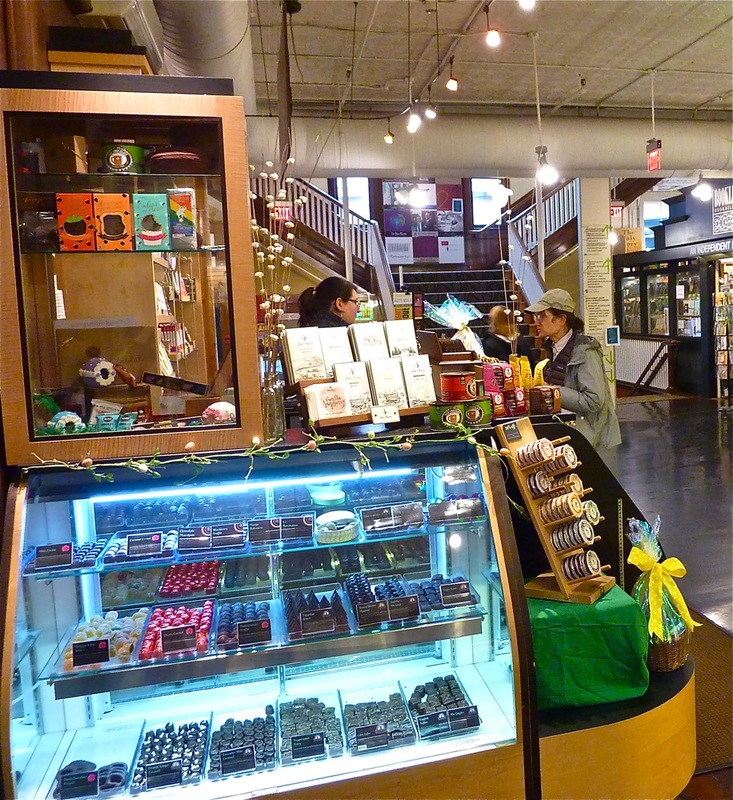 It's all here: caramel, collections, confections, truffles and vegan offerings. The chocolate manufacturing facility resides not far away from the main store at Thornes, isolated away in a spotlessly clean, remote part of the building (not publicly accessible). 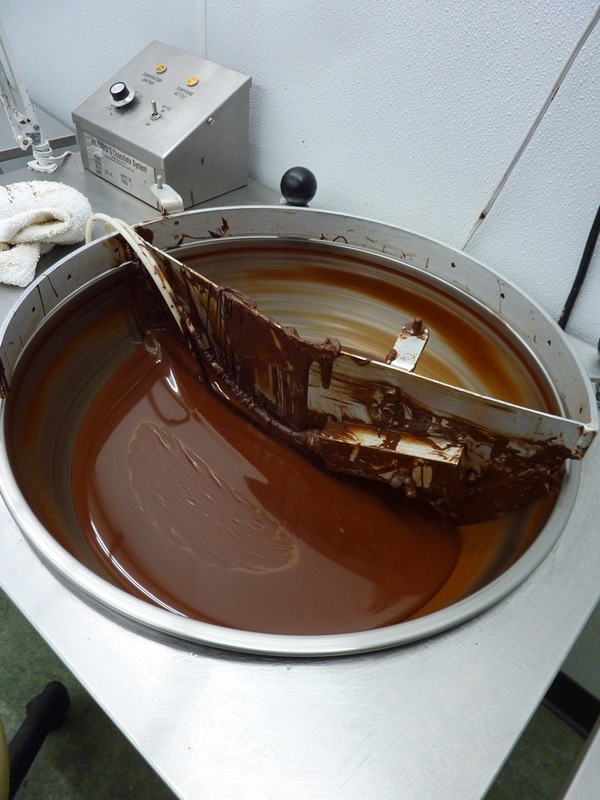 Chocolate being made by Heavenly Chocolate. 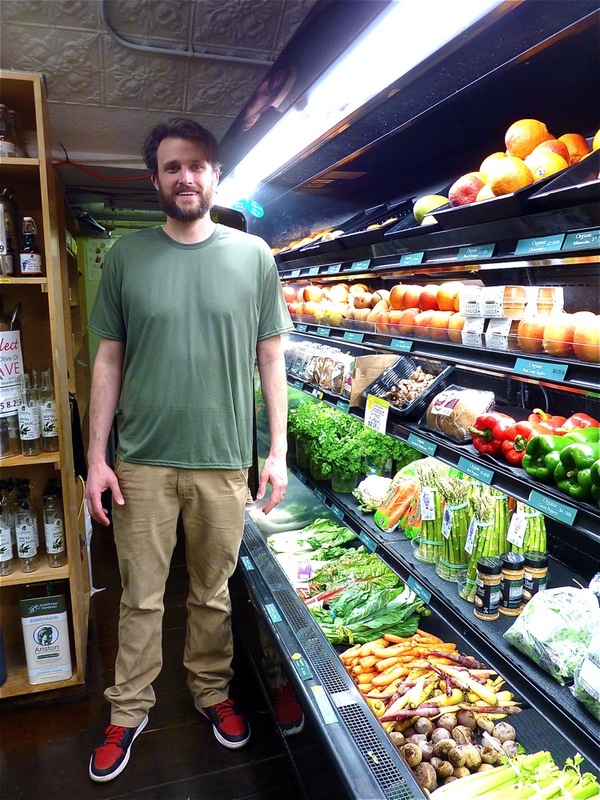 Cornucopia (Lower level 1) has served as an independently-owned natural foods grocery store since 1980. The store at Thornes is a perfect fit for a liberal, progressive community with health food, organic produce, supplements and natural body care products. Husband and wife Nate Clifford and Jade Jump bought Cornucopia from Bud Stockwell and Sydney Flum-Stockwell in March 2019 with the transition being flawless. If ever there was a hall of fame for locally-owned health food stores, this would be it. Cornucopia is jam-packed with high quality national brands and local merchandise, as well as an independent spirit that is heartwarming and endearing. "Many have memories of going into a mom and pop health food store and experiencing that health food smell," said Nate. "Yes, we have that, but have also evolved in the industry. Here, we understand our roots while trying to attract new customers." From vibrantly colored produce to bulk grains and teas, kombucha and locally grown bubble mushrooms, Cornucopia is a tour de force in health food merchandise. Nate is like an encyclopedia of health store knowledge and doesn't always follow conventional wisdom -- that's a good thing. As an example, supplement companies like Garden of Life and Megafood have been bought out by large corporations. Instead of dismissing the corporate buy outs, Nate watches to see if labels have changed and is on the phone regularly with reps and management to make sure quality hasn't been compromised. 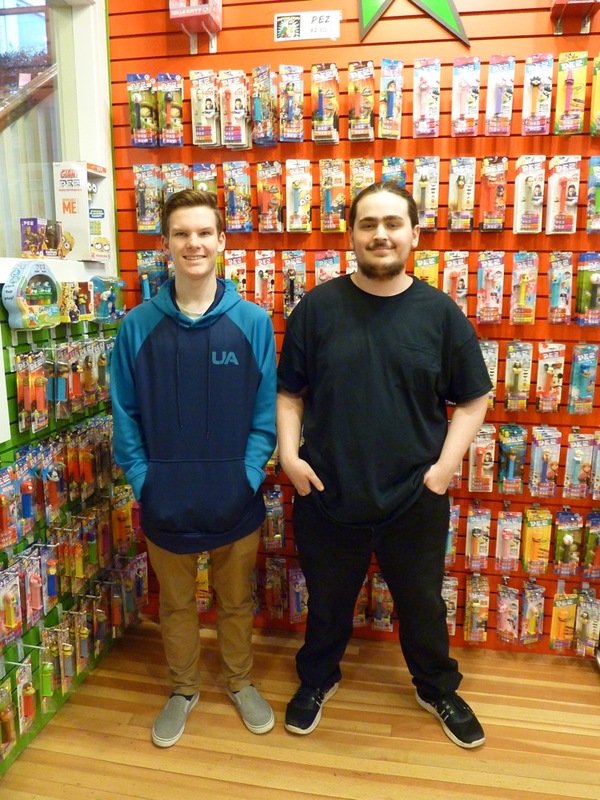 Nate and Jade are welcoming to everyone who comes into his store. "You can have a MAGA cap on or be a man in high heels -- everyone is welcome here," said Nate. 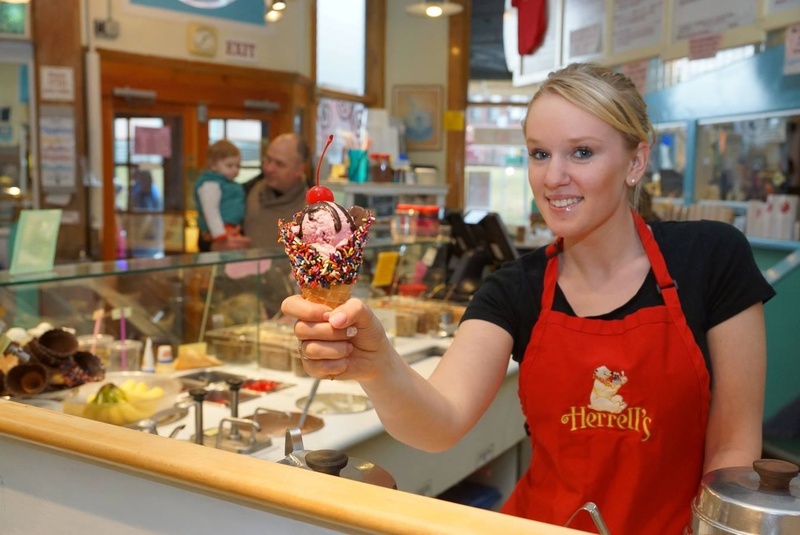 Herrell's Ice Cream (Lower Level 1) is a familiar name in Massachusetts. Founder Steve Herrell opened the first Steve's in 1973 in Somerville, Mass., with greater expansion following through the years. Best known for pioneering rich, creamy ice cream to a mass audience (no pun intended) and grinding up popular cookies and candies into the frozen treats, Herrell's is every bit as good today as it was at the beginning. Herrell's Ice Cream. Photo source: Herrell's Facebook fan page. Steve Herrell recently handed over the business over to partner Judy Herrell. Great that there's a location at Thorne's! Couple enjoying ice cream at Herrell's at Thornes Marketplace. Thornes Marketplace might be old, but youthful owners give great promise for the future of this Victorian building -- as young as 18-years-old in the case of Levi Smith. With the blessing of former owner Nolan Anaya and a loan with the help of his parents, Smith hopes to find sweet success with Captain Candy (Lower level 1). 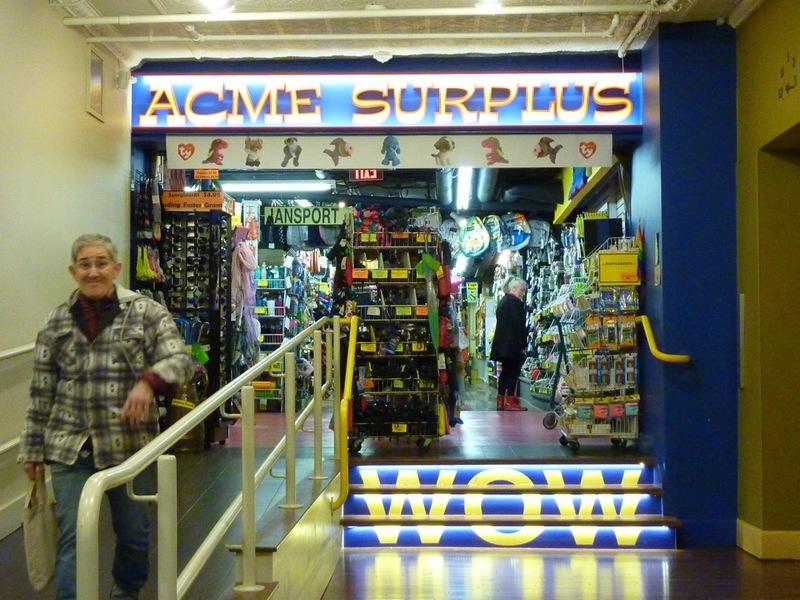 What better successor to carry on the shop than a kid in a candy store? Levi Smith and Issac Kingston at Captain Candy. The modest-sized candy store features "lots of candy you can't find anywhere else," said Smith. "Tons of stuff." Isaac Kingston, a manager at Captain Candy and not much older than Smith, said that this is the place to go for "Jelly Belly products with 60 varieties and Pez with 30 different choices." After spending just a few hours at Thornes Marketplace, it is apparent that this is not just a place for shopping, dining and services. It is a destination and one of the best hidden travel attractions in New England for all ages. Yes, it might not be a hidden treasure to locals but visitors definitely need to experience the magic going on here. In a part of the state that is best known for Six Flags New England, the Naismith Memorial Basketball Hall of Fame, the Springfield Museums, International Volleyball Hall of Fame, Historic Deerfield Village and Yankee Candle Factory, Thornes Marketplace surely has a place as a must-see destination. It's authentic, interesting, relevant, useful and, ultimately, memorable. The locals and students know all this to be true, many frequenting Thornes several times a week as a way of life in this charming, lively small city. "By coming in here, locals and merchants are benefiting each other," said Doele. "The merchants know that being here, you create your own store as a destination. It is really a fabulous place." Did you enjoy this story on Thornes Marketplace? If so, please share the graphic below on Pinterest. Thanks! Dear Northampton small businesses and community development people: I am extremely impressed with your city and can hardly wait to return. You have that rare mix of historic, rural and urban beauty with such a lively, wonderful downtown. If you liked my sponsored post story on Thornes, I would be so honored to write in detail about your family-friendly business and/or the city in general. I believe New England travelers would love to learn more about Northampton. VisitingNewEngland business partnerships differ than feature articles previously posted on VisitingNewEngland. Businesses pay a small, one-time fee to have pages like this appear, and first must be accepted by VisitingNewEngland.com editor and publisher, Eric Hurwitz, as a business he approves as part of "real New England travel" to keep the integrity of the site. Businesses that sign up for business partnerships receive priority by receiving more social media exposure and link placement on VisitingNewEngland.com. Contact Eric if interested in forming a business partnership. Explore Massachusetts travel! Read the Massachusetts Town Greens book -- Discover New England's first travel attractions: town commons. Includes a chapter on the Amherst town green!